Suffolk Law has boldly gone where few law schools have gone before, teaming up with one of the world’s leading legal process outsourcing companies, which will train students in an office right on campus. The students will work under the supervision of legal experts from Integreon, a leading legal process outsourcing company that specializes in the provision of innovative, technology-enabled legal services. The company has offices on four continents and across the U.S. While legal education on the whole has been glacial in its adaptation to shifts brought on by technology − including legal process outsourcing, client demands for increased efficiency through automation, and online services like LegalZoom − Andrew Perlman (left), Suffolk Law’s dean, has embraced such new approaches, launching the nation’s first Legal Technology and Innovation concentration, and now teaming his students with Integreon. The Suffolk Law students will have the opportunity to apply for paid positions working with Integreon’s experts to serve corporate clients. Students will contribute to projects such as contract review and abstraction, e-discovery and document review, spend analytics, and mergers and acquisitions (M&A) due diligence. As an example, some students may support an acquiring organization in an M&A transaction by analyzing contracts in order to summarize the impact of the change in control of ownership. In another scenario, a company switching to a new contract management platform or repository might have 20,000 legacy contracts to merge into the new system, with no efficient means of doing so. Students could help by extracting key data from the legacy contracts and inputting that data into the new platform, using Integreon’s innovative approach to make the process as efficient as possible. In 2009, Microsoft hired Integreon to streamline and handle its large number of routine procurement contracts. The company initially provided Microsoft a small, dedicated team of seven paralegals based in Integreon’s Fargo, North Dakota, delivery center. Today that team has grown to approximately 55 Integreon associates, supporting Microsoft from three different Integreon delivery centers across the globe. The team works in dedicated, locked-down areas of Integreon’s delivery centers and operates inside Microsoft’s firewall to ensure data security. 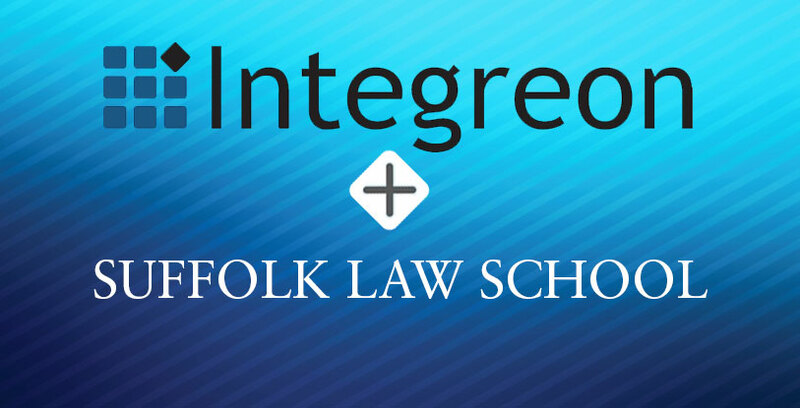 In addition to clients brought in by Integreon, Perlman will reach out to Suffolk Law alumni whose clients might benefit from Integreon’s efficiencies. Microsoft Associate General Counsel Lucy Bassli said she looks forward to working with the Suffolk Law students. “The skills these students will learn should serve them well when seeking employment. Legal services organizations need lawyers with cutting edge skills relevant to the modern legal marketplace,” she added. Mark Ross (right), head of legal process outsourcing at Integreon, said that Suffolk Law was a natural choice as a partner because of its nationally recognized practical training and 21st century legal technology programs. “Our partnership with Suffolk offers our clients yet another compelling legal service delivery model here in the U.S., and one which also helps train the next generation of lawyers,” he added. Perlman argues that training students in legal technology not only makes them more competitive, but also helps to address flaws in the justice system. For example, students in the law school’s Accelerator, a three-year program that cross-trains students in law, legal technology and business practices, are learning how to implement the types of legal process efficiencies that can help make legal services more affordable. This innovative partnership between Suffolk Law and Integreon is helping the law students of today become the legal workforce of tomorrow. They gain a multi-faceted education crucial to their success in the modern and rapidly evolving legal field.